It’s that time of year. People scurrying about – shopping, cooking, eating, drinking. Lots of drinking. As always, we here at “From a Bird’s Eye View” are here to make your life just a bit easier. Today, we provide our annual list of useless gifts for that hard-to-shop-for person on your list. Where else can you get this kind of valuable information? First, for the person who fashions him or herself as a “jock”, we have just the item. The ‘Nose Aerobics” game. 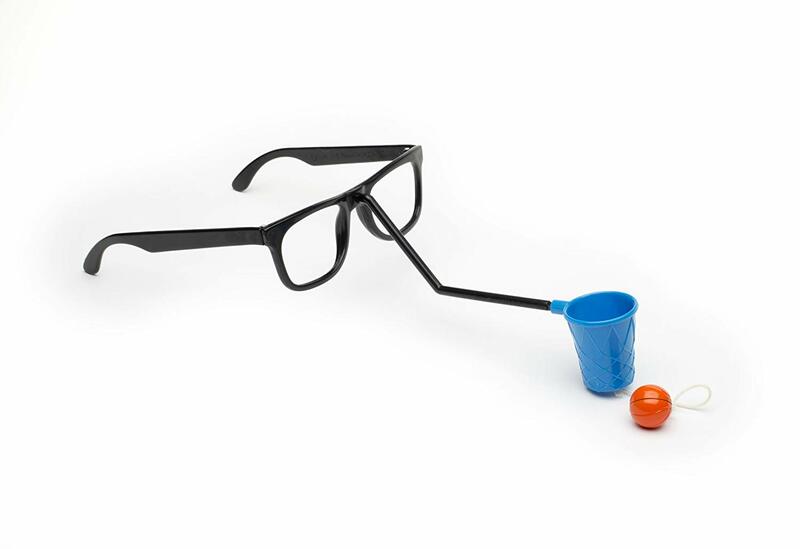 The recipient simply slips on the glasses and tries to flip the ball into the basket. It’s perfect for that brother-in-law who you’d like to bash in the head. What could be better than watching him do it to himself? Or perhaps it’s just the thing for the annoying cousin who is a perfect size 0 and just finished the New York Marathon. You can challenge her to get her nose in shape and she’ll sit in the corner with this and free everyone else from hearing about her split times and muscle cramps. Trust me, this gift has endless applications. Or maybe you have a new baby in the family. Frankly, babies think they can get by just being cute. We say it’s time to put them to work! 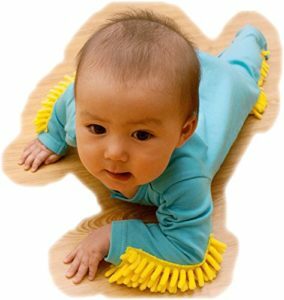 Place the “Baby Mop” on your infant and let the fun begin! You get to watch them try to crawl around, all the while getting your floors polished. Oh sure, they may get a little dust and dander up their nose but think of it as preparing them to live in China, where by the time s/he is an adult, everyone will be working anyway. Your baby will be miles ahead of the competition with their already-compromised lungs. 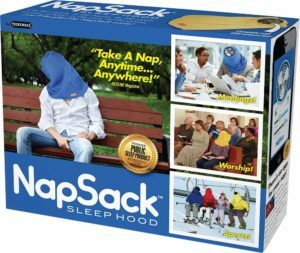 Next, for someone that you really like, do them a favor and give them the Nap Sack. For the love of God, where was this when I was working, sitting through endless boring meetings? Think of the times you’ve wished you could unobtrusively just nod off and no one would know. By placing the Nap Sack on your head people won’t know if you’re asleep or planning a terrorist attack. Either way, they’ll probably leave you alone to nap in sublime peacefulness. 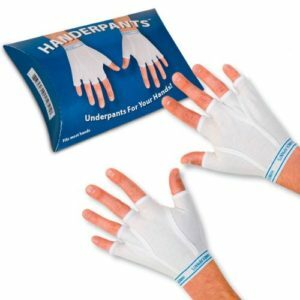 For the person who has everything a set of Handerpants might do. Again, not only can they keep hands warm but it’s a safe bet that anyone who sees a person wearing these will cut a wide swath. On the more practical side, I’ve seen some rather obscene tattoos on fingers lately so if you know someone who has “E.A.T. S.H.I.T” on their fingers this item could be helpful if they need to go to Grandma’s for Christmas dinner. Finally, there’s always that one person on your list who is difficult to please. They have everything, they don’t like anything you’ve ever given them, and frankly, they don’t deserve much. To the rescue comes The Gift of Nothing. This little ball of nothing sets the person straight – it proclaims that Nothing is better than Christmas. It is the ultimate gift of minimalism. Something that the neighbors in “Christmas Vacation” might enjoy. Or your sister who only wears black and eschews any form of holiday cheer. Nothing can be the perfect gift. We hope that these ideas prove helpful. You can thank us later. Thanksgiving Epilogue Lights Out . . . Christmas! These are absolutely perfect ideas! My personal favorite is the NAPSACK! I can think of so many meetings where I wish I’d had this…maybe get one for myself!